Thanks to Molly Priesmeyer for posting a link to this LOL-worthy pic by Chris Steller that shows a pair of billboards on University Avenue in Minneapolis that don't exactly compliment each other. 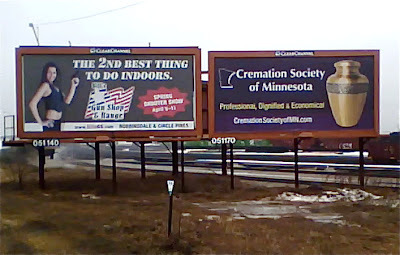 One is for a shooting range and depicts a woman holding a handgun while the other billboard is an advertisement for the Cremation Society. If we didn't know better, we'd say this was a good marketing ploy...but we know it had to be a happy accident. LOL!